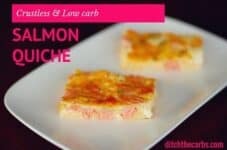 Following the success of my crustless bacon and egg pie, here is another variation – crustless salmon quiche. You all know by now my motto is “Real Food, Real Easy” and this is no exception. There is no need to even pre cook the salmon. Just make the quiche mixture in 1 bowl then add the diced salmon pieces. This is so simple and an incredibly economical way to make an expensive piece of salmon stretch for a family. You can also bake the quiche mixture in mini muffin tins ready for school/work lunches or a nutritious snack. Can be frozen in portions for a quick and easy snack. Wrap in baking paper and place in an airtight container to keep the crustless salmon quiche moist. 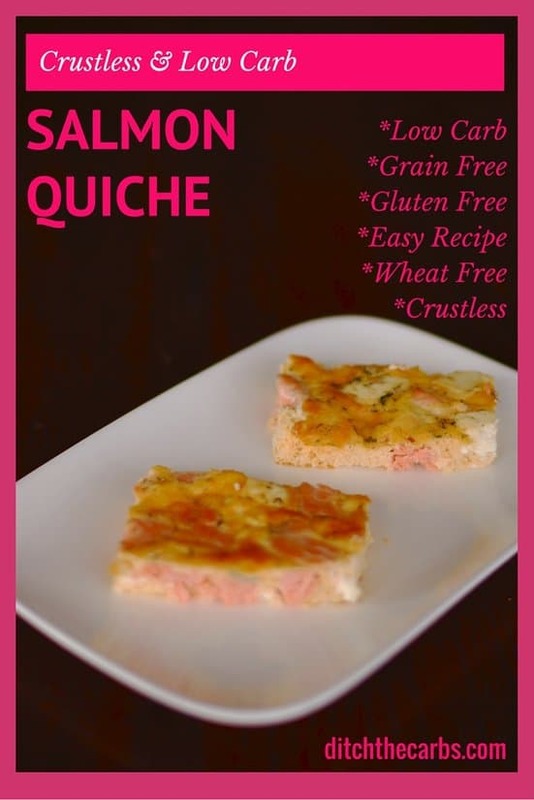 An economical way to stretch an expensive piece of salmon, is to make crustless salmon quiche. My top tip is to make the eggy mixture and pour in the tin, then place the salmon pieces evenly into the mixture so they don't clump together. Whisk the eggs with a fork. Whisk in the milk, salt, pepper, dill. Add the diced salmon and cream cheese. Mix gently with the fork. Pour into a greased lined dish. Move the pieces of salmon around until they are evenly distributed. Bake at 180C/350F for 30 minutes. Approximately what size baking dish or pie pan did you use? Is this uncooked, fresh salmon that is diced? Or is this canned salmon? Is the salmon cooked prior to making this? Thanks, I want to eat more salmon. Thanks for the recipe. I’ll try it! I never thought of using fish in a baked egg dish like this, but it sounds delicious! Do you eat this alone or add a side? I would add a huge salad or cooked leafy greens. Is there really 500g of salmon in this? Perhaps it’s 50g? Nope! I put 500g, which is generally one large salmon fillet. It helps to stretch one salmon fillet out between 5 of us. When salmon drops in price we just have salmon baked with salad, but when it is full price, this is the recipe I use. I absolutely adore salmon, just not the price tag. I added some capers to the mix….delicious! Like a salmon and cream cheese bagel! Yes. Place layers with baking parchment between each layer and freeze in an airtight container for up to a month. Hi,just wondering if milk could be sustituted with cream? If I would like to make this also dairy free, any ideas what I should substitute for the cream cheese and milk? The substitutions would also effect cooking times? You can omit the milk (I add it to make the quiche lighter) and the cream cheese (adds some fat to keep you fuller for longer) but I am unsure of non dairy substitutes. I could perhaps add coconut cream but it would impart a slight coconut flavour. Very yummy! I added in broccoli florets and cherry tomatoes for a bit of extra colour. My toddler loves it too. Great recipes on here thank you. Hi, im in Australia and im not sure the cream cheese is the same thing here. For me cream cheese is what we use in desserts or dips. Please confirm if what your using is more straight cream?? Thanks!! I’m in NZ so I think we may be able to get the same product. Look at this page with shows you what I keep in my pantry. It is the regular block of Philadelphia full fat cream cheese. Yes the sort you would possibly use in dips and desserts. It is quite adaptable to adding sweet or savoury flavours. I am concerned about the fat content with the eggs. Can you substitute egg whites for 1/2 to reduce the fat? No no no. You need all that wonderful healthy fat to keep you sustained and all the wonderful nutrients that egg yolks provide. 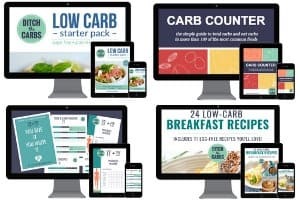 Read this page which will explain further, and this page to read all about cholesterol and why healthy fat is so important in our meals. Hello, I’m excited to try your recipes!!! My question is… can you freeze quiche? Absolutely. Make sure it is in an airtight container and defrost with the lid slightly ajar so any condensation doesn’t make the quiche soggy when defrosted. I would freeze for 1 month. Once it is defrosted, reheat in the oven at 180C/350F for 10 minutes per slice or it might require 20 minutes for the entire quiche. Hi Libby! What size dish have you used for this? Is it a 9×13? Can a 10in pie plate also be used or will it overflow? Yes it is. You could use a smaller dish as it is quite a shallow quiche. Whichever dish you choose, if you have any leftover mixture, you can bake it for 12 minutes or so in small ramekin dishes as a single serving or in muffin tins. It is close enough to cook the same, but always check the centre to ensure it is cooked all the way through. All our ovens will vary and the settings we use (fan bake, bake, top/bottom bake etc). Does it work if you cream the cheese with the eggs to make a smooth creamy mix, rather than curbing the cheese? I want to make this, but would like to use two filets of leftover blackened salmon. Would you suggest the same baking times and degrees? Yes the same temp and time are needed to cook the eggs. Test in the centre to make sure it is completely cooked. I made this to enjoy with a friend and it went down a treat. Thank you! I’m going to try it again tomorrow substituting the salmon for bacon and veggies. Will this work well with other kinds of fish? Hmm, not too sure. it would have to be a firm fish that doesn’t release lots of juices as it cooks like some white fish does. I love salmon too much, but maybe a smoked fish would be a great idea? Can you substitute canned salmon for the fresh salmon? Sure if you can find tinned salmon that is nice, I’ve never had much luck. Let us all know which brand you use. Yes, just throw it all together and it bakes up a treat! is that cheddar crusted on top?? No that’s just how the crust turned out. I think cheddar cheese might be a bit overpowering for the salmon. Very, very yummy – thank you again! You are my major source of recipes!! !